The proposed MP3EI plan of Indonesian government will surge the demand for tyres radically. The increasing investments in the sector along with growing demand for automobiles in Indonesia would contribute significantly to the demand for tyres during the next five years. With the growing per capita income and automobile sales in Indonesia, the demand for tyres is increasing consequently every year in the country. Wide availability of rubber has also contributed towards making Indonesia as one of the biggest manufacturers and exporters of tyres around the world. The poor infrastructure and transportation problems in Indonesia remain a big hurdle for the emerging tyre market; however, the proximity to natural rubber production centers is encouraging the tyre companies to expand further in the country. 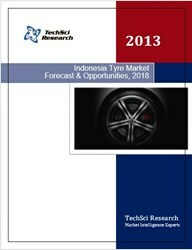 According to the recently published report by TechSci Research ‘Indonesia Tyre Market Forecast and Opportunities 2018', the tyre industry in Indonesia is expected to grow at the CAGR of around 15% during 2013-18 due to continuous increase in automobile sales along with the demand for tyres in the replacement market. The report analyses key tyre companies in the Indonesian tyre market, which are Bridgestone, Gajah Tunggal and Sumi Rubber. However, with favourable factors like continuous increase in the sales of automobiles, availability of rubber and infrastructure development, new companies like Pirelli, Hankook and Michelin are also planning to establish their manufacturing plants in the country to increase their presence in the Indonesian tyre market. The report also reveals the growing importance of retreading tyres. The tyre retreading business in the country is also being accepted at large scale and domestic players have considerable share in the retreading market, giving stiff competition to foreign companies. “Indonesia is a country that is rich in natural resources, such as rubber plantations. While the increasing per capita income is driving the growth of passenger car and motor cycles along with their tyres, the plantation and mining activities in the country has kept up the sales of commercial vehicles and tyres as well. The increasing investments in the sector along with growing demand for automobiles in Indonesia would contribute significantly to the demand for tyres during the next five years,” said Mr Karan Chechi, Research Director with TechSci Research, a research based global management consulting firm. “With the introduction of LCGC (low cost green cars) program in the country, many global automotive companies have also expressed their interest in entering this segment of vehicles. It is expected to generate significant demand for tyres consequently in the next five year,” added Mr. Chechi. ‘Indonesia Tyre Market Forecast and Opportunities 2018’ has evaluated the future growth potential of Indonesia tyre industry and provides statistics and information on market structure, exports and future growth of the tyre industry. The report is intended to provide cutting-edge market intelligence and help decision makers to take sound investment evaluation. Besides all this, the report also identifies and analyses the emerging trends along with essential drivers, challenges and opportunities available in the tyre industry.